-A magical place where it is always a quarter past five. There is a very special place in East Tawas. A place we visit every time we drive north. It's a place with exceptional ... well, everything. Wine. Coffee. Gourmet cooking utensils. Fine dining linens. Cooking sauces. Did I mention wine? Rebecca Buchanan is a wonderful proprietor and incredibly engaging. Much like our love of Art of the Table, Rebecca has the same approach and philosophy of good food and good dining - all must be accompanied by good wine. Okay, maybe GREAT wine. It was Rebecca who turned me on to Educated Guess. I keep cases of that around for good meals and gifts. It is one of my favorite wines ever. When we walk in her store, her first question is, "what are you cooking?" When we answer, she thinks. She ponders. Then she suggests. We usually leave with a couple of bottles of wine because we can never make up our minds. And she has great coffee - both whole bean (that she will grind for you) and coffee machines to grab a latte or a frou-frou coffee. They are great. I walked about with another pound of Rocky Mountain Espresso blend. As much as it pains me to say, she has Starbucks beat hands down. Usually she is there with her little daughter Hailey who wanders around saying hello to customers. People stand around and talk to Rebecca - she listens, engages, and laughs with all her customers. Brew Krew is worth the drive north. Stop in. Shop. Enjoy. Welcome to the Sunrise Coast of Michigan, located on the beautiful shores of Lake Huron. 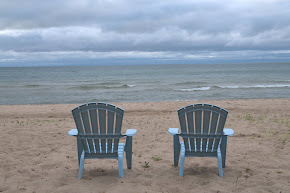 Our cottage, East of the Equator, sits on the stunning sugar sand stretching from Tawas to Greenbush. It's simply beautiful here. We started this blog because so few Michiganders think about the east side of the state for vacations and long weekends. We think that is a colossal mistake. We encourage you to explore the Sunrise Coast. Our hope is to share in words and pictures the joy, the beauty, and the wonder we find every time we drive north. Come visit. 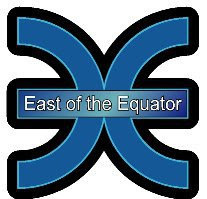 Cheers from East of the Equator!